Windy Arbor Primary School has undergone refurbishment, and vertical bar metal railings have transformed the appearance of the school. 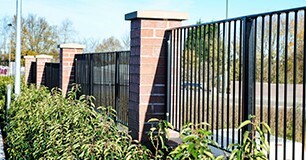 Alpha Rail fabricate and install a range of galvanized metalwork including metal railings, gates, Juliette balconies, estate fencing and pedestrian guardrail. 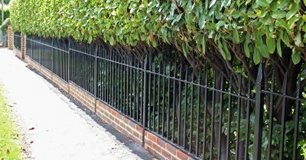 Our team of specialists manufacture all metalwork in our own workshops which means we can also supply bespoke architectural metalwork and other finishing touches such as bollards, barrier gates and decorative archways. We have almost thirty years of expertise and when browsing our past experience you will see that Alpha Rail metalwork has been used on many high profile projects. 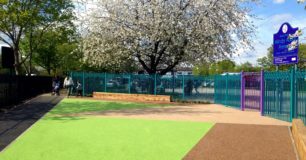 We are happy to work on commercial projects working directly for public sector organisations or alongside architects, building and civil engineers, fencing and landscaping contractors. We also work for private individuals who require a bespoke solution on a prestige residence. We have a loyal customer base who we are proud to say use Alpha Rail time and time again due to our steel fabrication expertise and our commitment to exceptional customer service. As well as offering a comprehensive supply and fit service, we are happy to simply supply and deliver.